Today, Sampson Lewkowicz of Sampson Boxing, in conjunction with the World Boxing Council (WBC) and its President, Mauricio Sulaiman, proudly announced "The Jose Sulaiman Cup: WBC Super Welterweight Tournament." An eight-man, single-elimination tournament featuring top super welterweight contenders from eight different countries and three continents, "The Jose Sulaiman Cup" is being held to honor the late WBC President, Jose Sulaiman. The tournament will begin with two brackets of four fighters each. In bracket one will be WBC #8 John Jackson (19-2, 15 KOs) of the US Virgin Islands facing WBC #13 Dennis Laurente (49-5, 30 KOs) of The Philippines, and Cuba's Yudel Jhonson (16-1, 9 KOs) taking on Mexico's Jorge Cota (24-1, 22 KOs). In the second bracket, WBC #5 Sergey Rabchenko (25-1, 18 KOs) will fight Argentina's WBC #10 Luciano Cuello (35-3, 17 KOs), and the USA's Domonique Dolton (15-0, 8 KOs) will face Poland's Lukasz Maciec (22-2-1, 5 KOs). 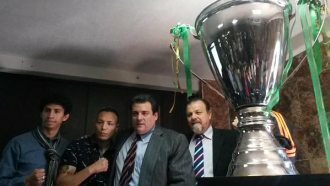 The winners of these fights will then face each other in a semi-final and then those two winners will fight, for the right to have their name engraved on the inaugural Jose Sulaiman Cup. Opening-round tournament participants will receive $50,000 each for their participation. Making it to round two will earn each fighter $100,000 and a trip to the finals will bring a purse of $200,000 to both participants. Making the finals will earn both fighters $350,000 in one year. Every tournament match will be conducted under rules of the WBC, in conjunction with the local boxing commission. The first phase will be held in April/May and the fights will be scheduled for 10 rounds each. The semifinals will be held in September 2015 and scheduled for 12 rounds and the final in February 2016, also over 12 rounds. "This is a project that is near and dear to my heart," said Sampson Lewkowicz. "It was first the idea of the great Jose Sulaiman and had to be postponed when his health began to fail. And so I am honored to be working with Mauricio and the WBC to bring his father's vision to life and honor him by doing so." Dates and venues for "The Jose Sulaiman Cup: WBC Super Welterweight Tournament" will be announced shortly.